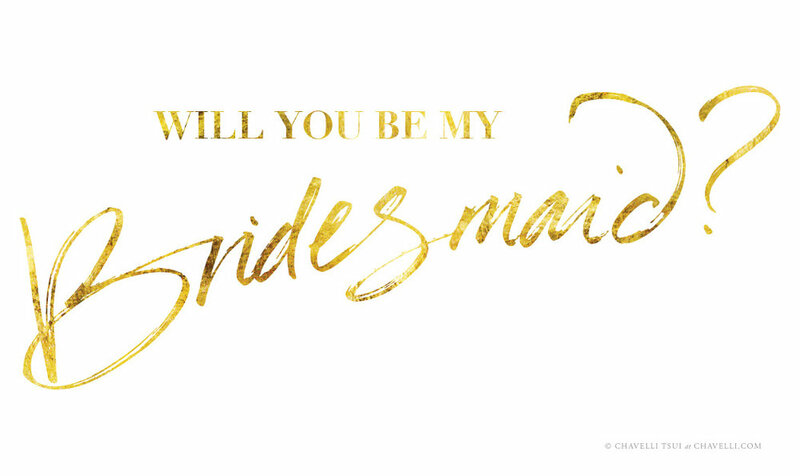 There are so many different ways to pop the question to your bridesmaids. Sure, if you live in the same city you can just invite them out to drinks and ask in person, or if pressed for time, just send them a text. 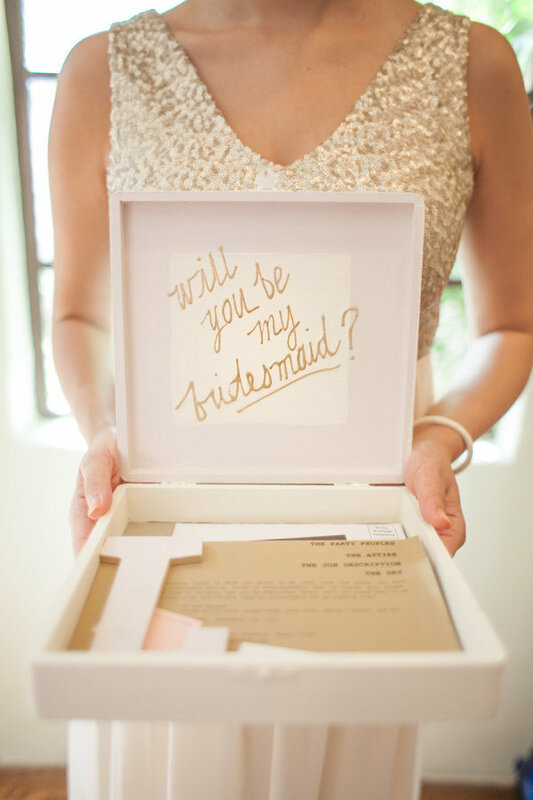 However, there are also tons of fun-filled, special ways to ask your bridesmaids to be a part of your big day while making memories. If you’re looking for a personalized—and cute!—way to ask your main ladies to help you celebrate your special day, you might be want to consider making a bridesmaid box. You can find hundreds of examples of bridesmaid boxes on Pinterest with just a simple search. But with so many to choose from, trying to figure out what to actually put into a bridesmaid box can start to become a tedious and stressful task. Here are 5 main components you need to make your bridesmaid box. Personalized Bag: Get a gift bag for each of your bridesmaids and add hand lettering to them to personalize each of the bags. Add some tissue paper and you’re all set. A Simple Gift Box: If you’re not artistic, go for something simple like a gift box. Add some ribbon or a bow to the top and you’re done! Treasure Chest: Here is your chance to get a little creative. These wooden treasure chests can easily be stained, decorated, or painted any color you’d like. Add some colorful shredded paper to the bottom to make your items really pop. Turn it into your own fabulous hamper! There are dozens of clever sayings on cards out there, though keep in mind that this is the place to let your friend know how valuable they are to you and how excited you are to have them there next to you on your wedding day. Here are a couple sayings, but as always, personalize it and add your own heartfelt message. I have my mister, but I can’t do it without my sister! He popped the question, now it’s my turn. I found my man, but I still need my girls. I couldn't tie the knot without you. Include something in your box that could only be given to this person. This could be something simple like a picture frame with a picture of the two of you, or something nostalgic, but it should be something that only they would understand. Photograph of you both: Find one of your favorite photos of the two of you, and pick out a cute frame to put it in. If you have a long distance best friend, consider a frame like this one or this one for one of your close friends. A Monogram: What better way to personalize a gift for them than with a monogram! There are so many different gifts you can monogram for them. Get them a monogrammed necklace, cosmetic bag, or personalized notebook. If they aren’t a big fan of monograms, do their full name instead. Special token: This doesn’t have to be something practical. If you and one of your bridesmaids has an inside joke, look for something that will remind them of it. If they’re your childhood best friend or sibling, look for something that will remind them of when you were kids. Jewelry: rings and bracelets are perfect for this, and you can either give each bridesmaid the same thing as a memento, or pick something special for each person. Lipstick: if you're not sure what color would work best, places like Bite Lab let them go make their own color blend! This doesn't have to be something edible! If you’re looking for something that’s not edible go for something that smells nice instead. It will help make the whole box smell wonderful when they open it (just be sure it won’t make a mess!). Candy or baked goods: ring pops are classic and fun! Or perhaps a box of delicious Ladurée macarons? Candles: there are so many luxe brands out there now! Wine or Champagne: mini bottles will fit perfectly in a bag or a box! 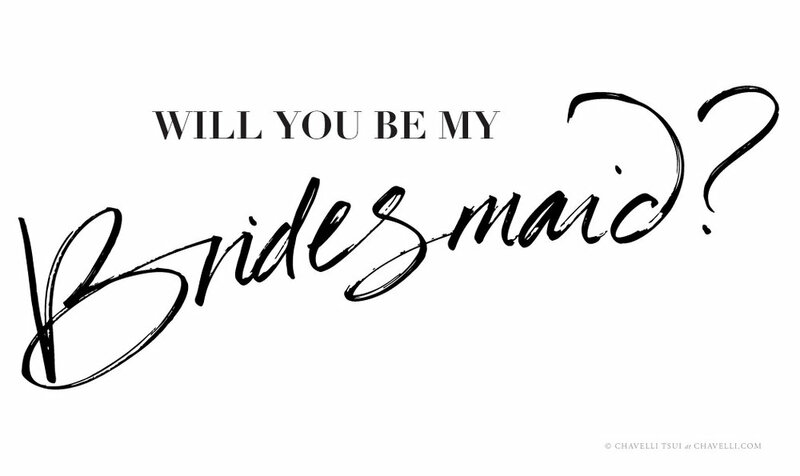 At the end of the day, despite all the fun and fancy ways you can ask you bridesmaids to be there for you, just make it personal. Putting together a bridesmaid box for them is a unique and special way to share this special moment in time with your bridesmaids.